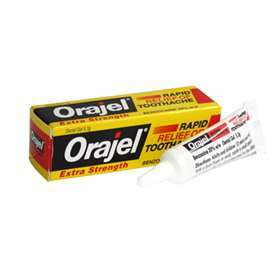 Orajel Extra Strength Dental Gel with Benzocaine 20% w/w provides rapid relief from the pain of toothaches (open cavities). Orajel Extra Strength Dental Gel contains Benzocaine. Benzocaine is one of a group of medicines called local anaesthetics. Orajel Extra Strength provides relief by numbing the area and therefore reducing the pain. Extra strength formula containing Benzocaine 20% w/w. Intended for short-term use until you can get to a doctor or dentist. Do not use on children below the age of 12 years. Adults and children 12 years and over, remove car, cut open tip of tube on the score mark, and with a clean finger apply an amount of gel the size of a green pea to the affected area. You should avoid taking hot drinks whilst using the gel. Polyethylene Glycol, Sodium Saccharin (E954), Sorbic Acid (E200), Clove Oil, Spearmint Flavour.